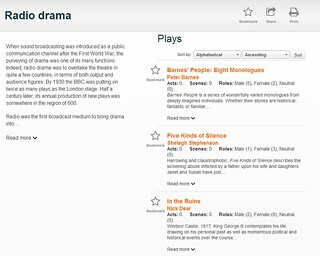 The Shakespeare Collection is an extensive collection including e-books of the most recent Arden Shakespeare editions, other editions and adaptations of Shakespeare’s works, other works published during Shakespeare’s time, prompt books, theatrical diaries, criticism, reviews, images, and reference materials. 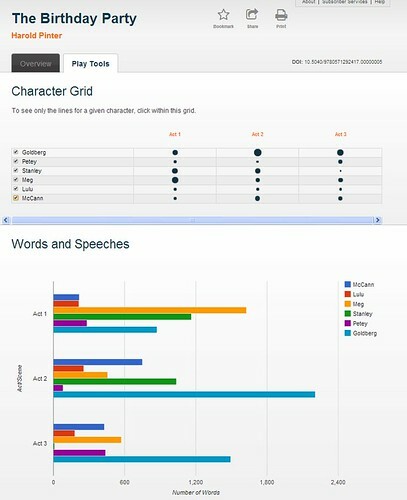 It is a great place to begin studying Shakespeare, and has lots of clever features. Under Texts – Arden editions select they play you are interested in and you can read the full text. Click on View Notes to read the Arden notes on the text. You can also compare historical editions of texts with the recent Arden edition. 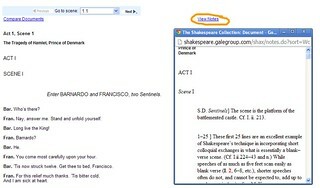 Open The Shakespeare Collection and go to the basic search page. Enter “Hamlet”, select the “Keyword” radio button, and click on the search button. Under the Arden tab, mark the Arden edition of Hamlet. Under the Historical tab, mark the second and third items (Quarto 1 and Quarto 2). Open Quarto 1 and click on the “Compare Documents” link. Scroll around in the left window to get a good view of the play. In the right window, open the Arden edition of the play. Scroll and compare the two versions. In the Arden edition, select “View Notes” for more information about the scene. In the top right corner of the right screen, select “Compare Another”. Open the 1604-1605 edition of the play. Page forward to get to the start of the play. You can use the Basic Search to find a quotation, or instances of a word or phrase. 1. Type the quotation into the search bar, and select the “Entire Document” radio button. Click Search. 2. Choose “First Relevant Scene”. The quotation you searched for will be displayed in red. 3. Choose the “Next” button to skip to the next instance of the word/quotation.